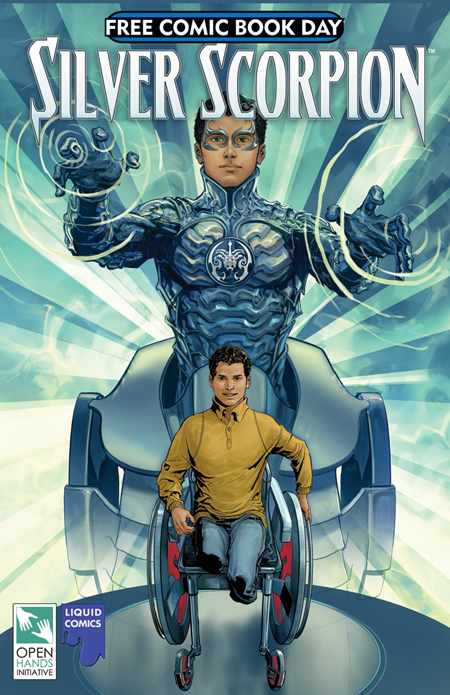 NEW YORK, NY— April 24, 2012 –The Open Hands Initiative, in partnership with Liquid Comics and MTV Voices, announced today the newest rendition of the Silver Scorpion comic book character – an animated web series featuring the world’s first disabled cross-cultural superhero. Silver Scorpion is the brainchild of a group of American and Syrian youths with disabilities who gathered in Damascus a little more than a year ago. The hero they envisioned, an Arab teen that loses his legs in a tragic accident, has the power to not only bend metal with his mind, but—the creators hope—to transform his world… and ours. “MTV Voices is all about giving young people a platform to express ideas, aspirations, concerns about the world in a creative manner”, said John Jackson, VP of Social Responsibility, Viacom International Media Networks. “The Silver Scorpion project and how its super hero was conceived absolutely reflects that core value and is a natural fit for MTV Voices. Through the story of the super hero, the young Americans and Syrians involved with the project have found a way of sharing their values with the world, and MTV Voices is delighted to bring that to our audience, encouraging them to engage with us on the narrative, the ideas and the vision”.